Does that sound reasonably healthy, the sort of dinner a person should eat who is trying, if not exactly to lose weight, not to put on any more….? It was very nice but I wish there was pudding…..it’s so cold and grey. Come on weather! Get a move on; the birds are singing away like mad, the doves are cooing, the song thrushes are turning over the leaves, the magpie juveniles are holding conferences on the football field, there are enough of them out there for a tournament: there are little teeny tiny buds on the plum trees: and Zeb is in love with a Basset Hound called Issy… I can see what he finds attractive about her, a certain jaunty lilt to her walk… it must be Spring. Please, soon. And in the meantime, I think pudding might have to be considered…. 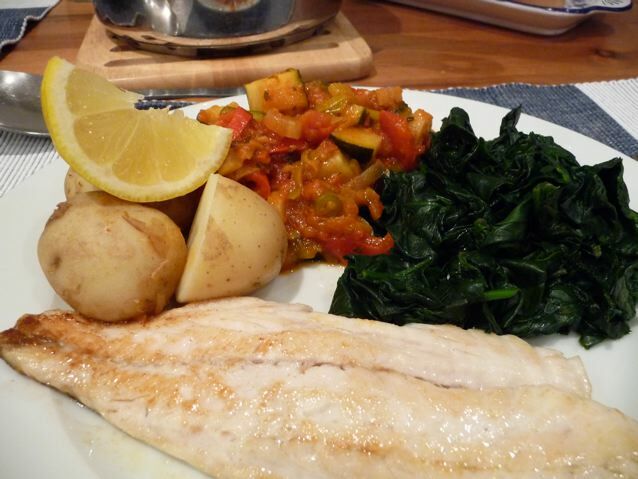 This entry was posted in Asides, Supper Dishes and tagged chilli tomato sauce, seabass, supper on 22/02/2011 by Joanna.